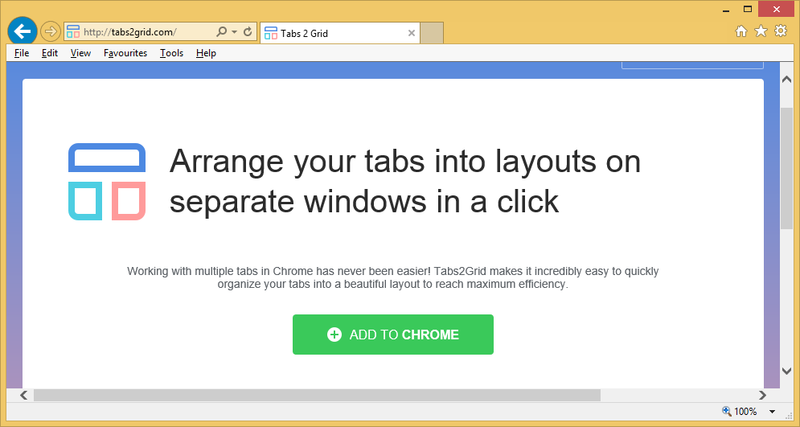 Tabs2Grid is a malicious Google Chrome extension, also considered to be adware. You might have encountered the extension somewhere, thought it was useful and installed it. Or installation could have been forced on you. It could have been added to some free program that you installed, or it could have come together with some kind of malicious threat. This adware is advertised as a useful extension that allows you to arrange Chrome tabs into layouts on separate windows. While that certainly is a useful feature, you should not choose this extension if you need these services. This add-on will generate huge amount of advertisements, bombard your screen with them or redirect you. While not always the case, some of the ads could be malicious and might lead to a serious malware infection. Remove Tabs2Grid virus. You need to pay more attention to what you install. This extension was added to some program that you installed, and you did not notice. If you insist on installing questionable programs, at least ensure that you deselect everything added to it. That is done in Advanced or Custom settings of the freeware installation process. Make sure you deselect everything. Only then should you proceed. You should also also avoid downloading anything from questionable sources, like pop-ups and third-party stores. If you want to avoid having to delete Tabs2Grid virus, pay attention to what you install and how you do it. How does it affect the computer? If you notice the infection added to Google Chrome, then you must already be seeing adverts. They will appear randomly as you browse and will interrupt whatever you are doing. You might just ignore them in the beginning but eventually you will get sick of them. And the only way to fully get rid of them is to uninstall Tabs2Grid virus. It’s not a good idea to click on any of the ads while the adware is present on the computer because some of them might not be safe. You could be exposed to something malicious and it could bring about a malware infection. Adware in general aims to make income by having you click on as many ads as possible. It may start gathering certain information about you and your browsing habits so that it could make more personalized adverts. Ones you are more likely to click on. Using the extension is not a good idea as all it will do is expose you to adverts. Remove Tabs2Grid virus. It may be difficult to manually delete Tabs2Grid virus as these infections are purposely made hard to find. The easier way would be to obtain anti-spyware software and have it uninstall Tabs2Grid virus for you. You need to make sure Tabs2Grid virus removal is carried out fully and no leftovers remain, as otherwise, it could restore itself.